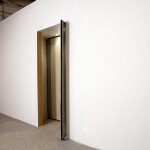 Melissa Laing will install in the front gallery a flow control mechanism, a shifted rotating door. 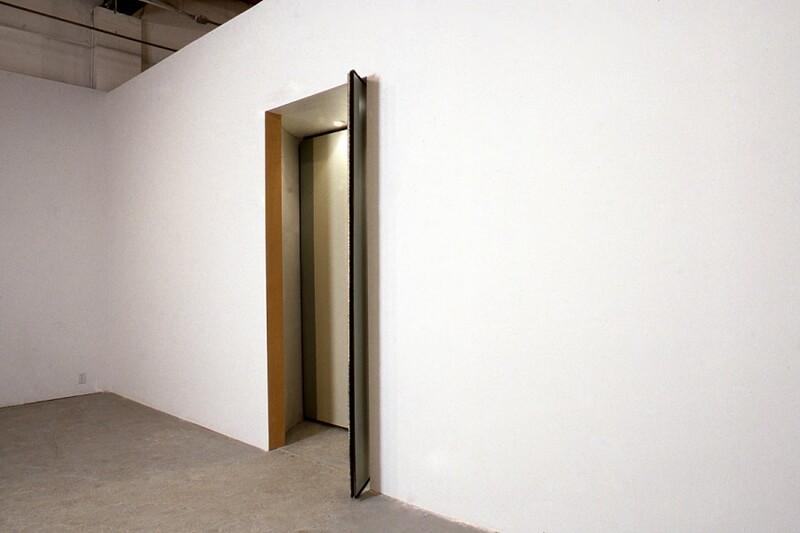 Dividing the gallery, the off-centered door is the only access point from one space into another. 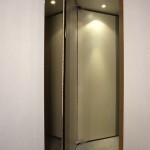 The door can be swung back and forth in a limited manner and only allows the passage of one person at a time. By messing with a seemingly effective design, Laing’s architectural installation slows things down. Like the original design, her adaptation controls movement, but by shifting the pivot point she stops the now naturalized flow almost reversing it. Melissa Laing says that her work is about time, specifically those moments when we are forced out of its flow. She constructs waiting rooms, where people wait for nothing. She produces epic films where nothing happens. Her practice focuses in on moments of frustration, arguing that it is in these delays, that the rhythm of the rest of our lives becomes clear. Laing is coming to Toronto from Berlin, from Holland, from New Zealand. She spends time out of time, in precisely the kinds of spaces she struggles with in her practice. For Mercer she proposes to make a revolving door, its centre of rotation mounted a few inches from the centre of its housing. The door swings off its orbit, rotating but not revolving, moving back and forth. Its banging interrupts the even sound of sweeping brushes. 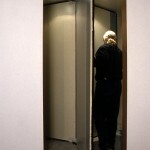 A standard revolving door is a machine that regulates flows of air and people. 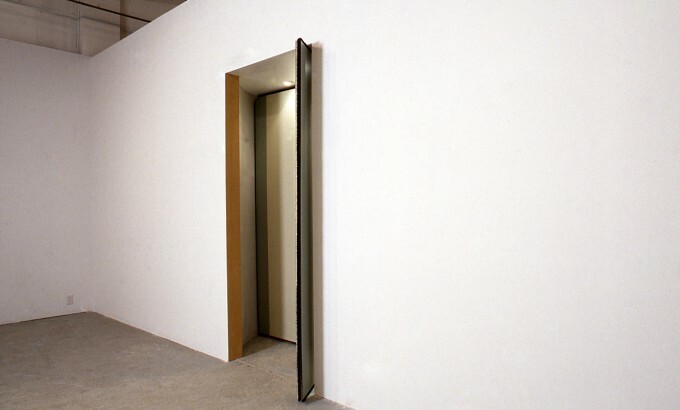 The door at Mercer allows passage, but only through a double motion of pulling-entering, pushing-exiting. This new binary device works in two ways: as a physical and social mechanism, and as an epistemological time machine. Laing’s projects appear, at first, to stand outside our own historical period. They appear slightly anachronistic, referring to the spaces of modernity. Her waiting room in the Czech Republic with its continuous soundtrack of train announcements resounds with the discomfort of socialist bureaucracy. Once social equalizers, generic waiting spaces now emphasize uneven development, signifying something that’s behind the times. They’ve become sorting mechanisms dividing people according to new class formations. We encounter them using slower modes of transportation such as buses and trains, in developing countries and in bureaucratic spaces. Those who can afford to avoid them, hanging out in first-class lounges where they can connect by phone, fax and internet, or sipping coffee at the airport Starbucks. Either way they are not out of time, but tapped into contemporary cycles of either production or consumption. The revolving door was a modern invention, but it is durable. It is as at home in the contemporary mall as it is in the department store, or as comfortable on a suburban corporate villa as an early sky scraper. 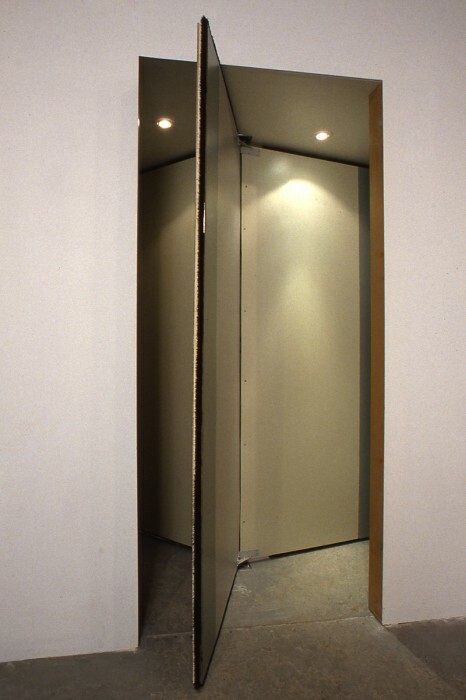 The revolving door is a hinge object between modern and post-modern cultural periods. In 1967 Guy Debord argued that society had entered a “pseudo-cyclical time,” during which actions repeat, not with the variable natural rhythms of days and nights, seasonal occupations, and life cycles, but rather according to the serial and always frustrated desire for commodities. * The revolving door is tied to the architectural forms of post-fordism. Two thousand people per hour can pass through one, allowing brainworkers into office buildings on time, and consumers into malls at any time. For Debord, what is needed to shake people out of their endless repetition are their collective steps into a flow of history. The door Laing is proposing has been sabotaged. What normally travels in circles instead swings abjectly in and out, never really opening up and not quite closing. 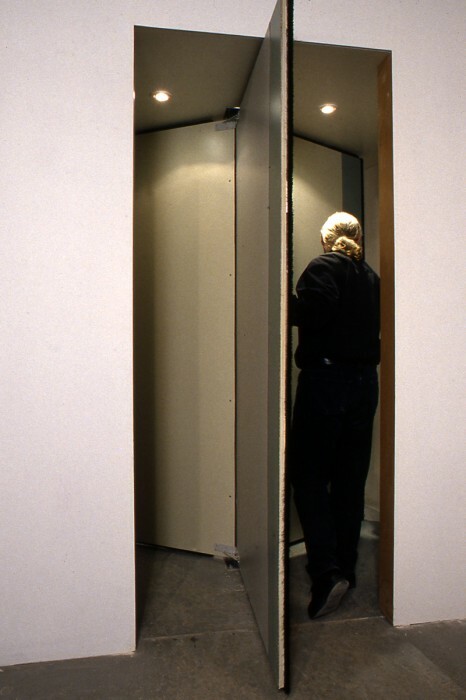 It functions somewhat like a conventional door, but it retains of its centred model an experience of duration and enclosure. The revolving door is itself a waiting room; it takes up time and space. Yet people experience this moment alone, without communication. It operates according to factory logic. The time of passage is a condition of the speed of the line. In a factory, communication between workers is a necessary antagonism to production, allowing their autonomous organization. Laing’s broken door disrupts the atomization that the cells of the revolving door create, and in its place the door produces communication. The leaves are still connected, but the direction of motion is two-way, producing an awkward confrontation between people moving in different directions at the same time. Her project is a social machine, coding conversation between users in a binary language. It is also an intimate mechanism, creating opportunities for bodies to press past one another. No longer is passage structured as a controlled conflict-free process, instead time itself is negotiated between subjects.